We’ve seen photos of some amazing collage & gallery setups, but how do you actually go about creating your own? 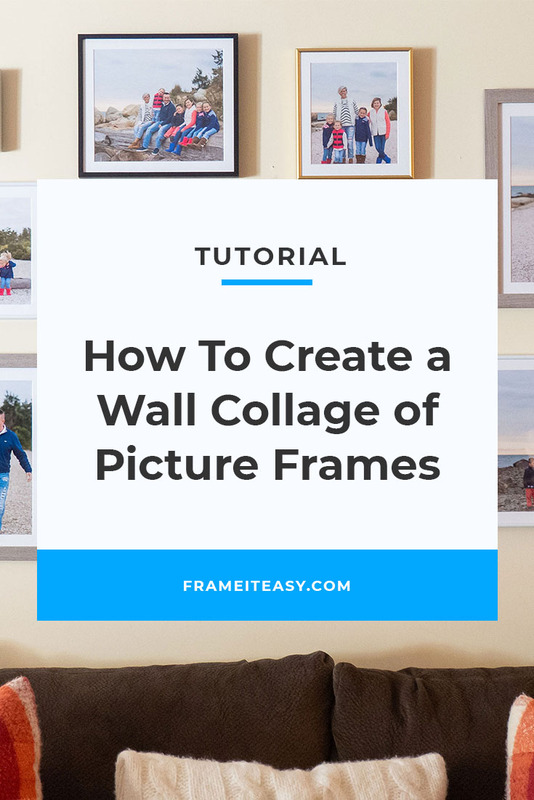 In this handy guide, we’ll walk you through the steps to create a super simple wall collage of picture frames! The first thing to do in creating a picture frame collage is to choose where you want to put it. 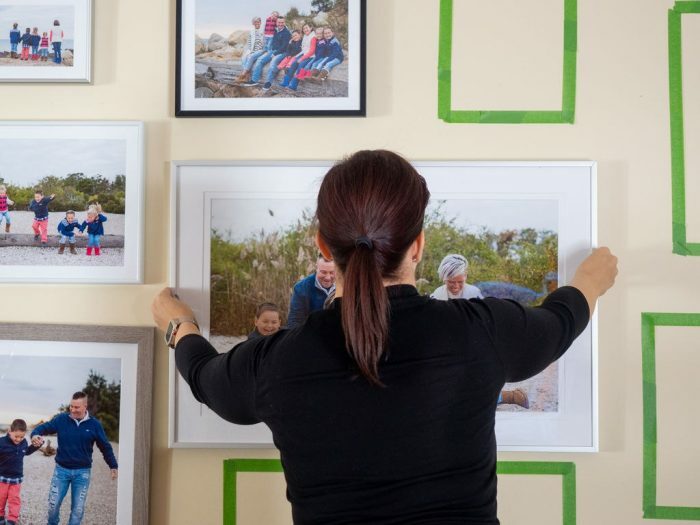 Choose a spot that is easily accessible — this will not only make it easier to hang your photos, but it will also be easier to dust, add in more frames, and/or swap out new photos as time goes on. Choose a spot that is well-lit — you want to be able to enjoy seeing your photos once they’re up! 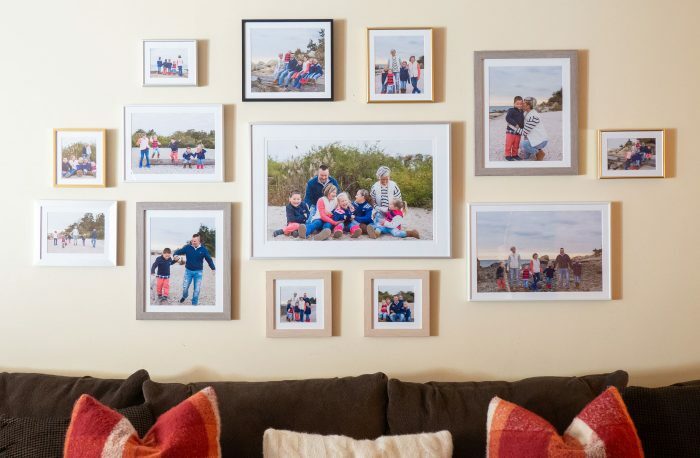 Consider a theme — if you’re going with a collage of family photos, maybe your living room is the perfect spot. 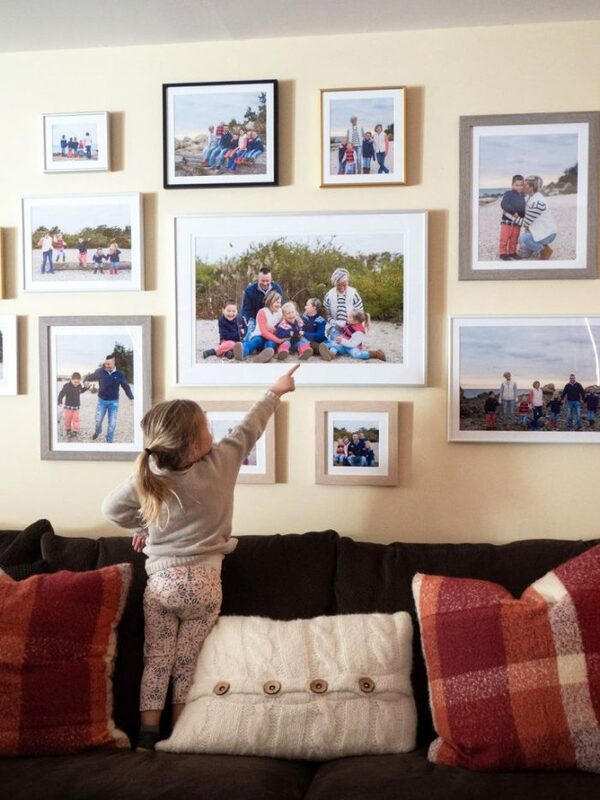 Or maybe you’re creating a gallery of your kids as they grow up so you want them to see the photos in their playroom. Sometimes the theme of your gallery will help dictate the perfect location or vice versa. Don’t be afraid to think outside the box. A hallway or bathroom may not be the first place you think of, but don’t discount any space you can make work. 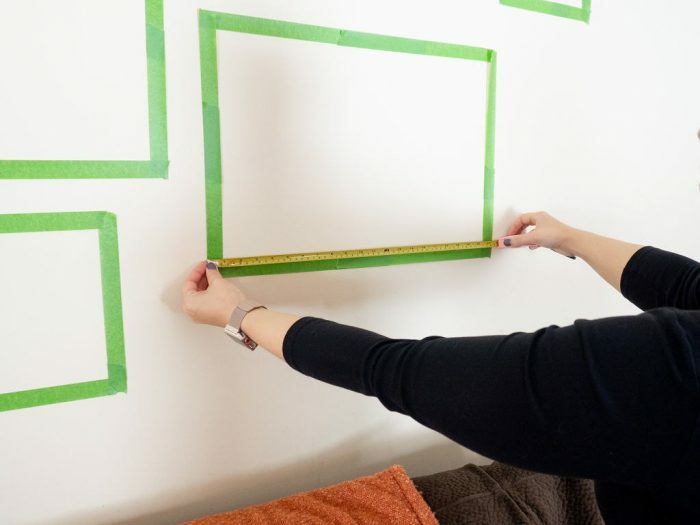 While there are a number of ways you can plan your picture frame arrangement, actually seeing the wall blocked out is the best way to visualize the space. 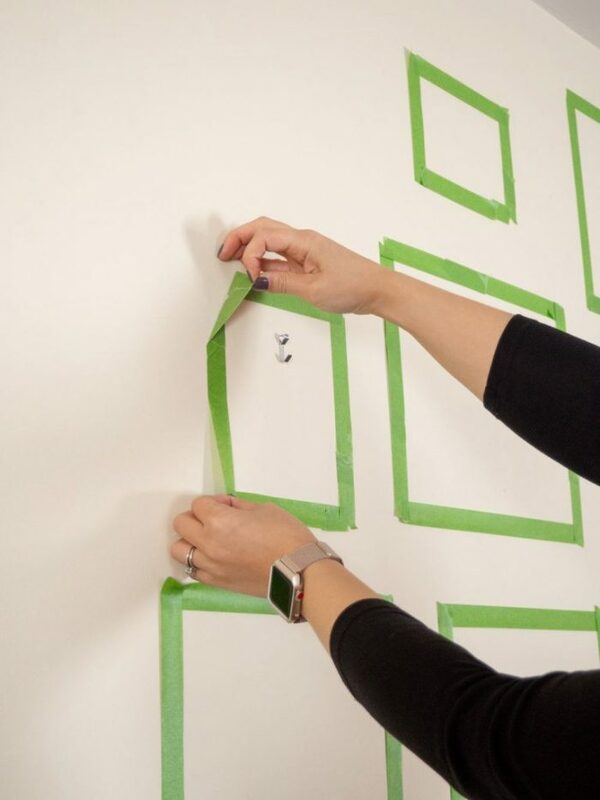 By using painter’s tape you have the flexibility to not only adjust and create any size that fits best, but it’s also easy to remove. Now is the time to decide if you want a uniform gallery (where each frame is the same size/style) or an offset gallery (where you arrange all different size and style frames.) If you choose to go uniform you’ll want to be extra precise when blocking, and if you’re going offset you have a little more creative freedom. Focus on the overall look of your gallery rather than the exact dimensions of each frame — we’ll cover sizing in Step 4. 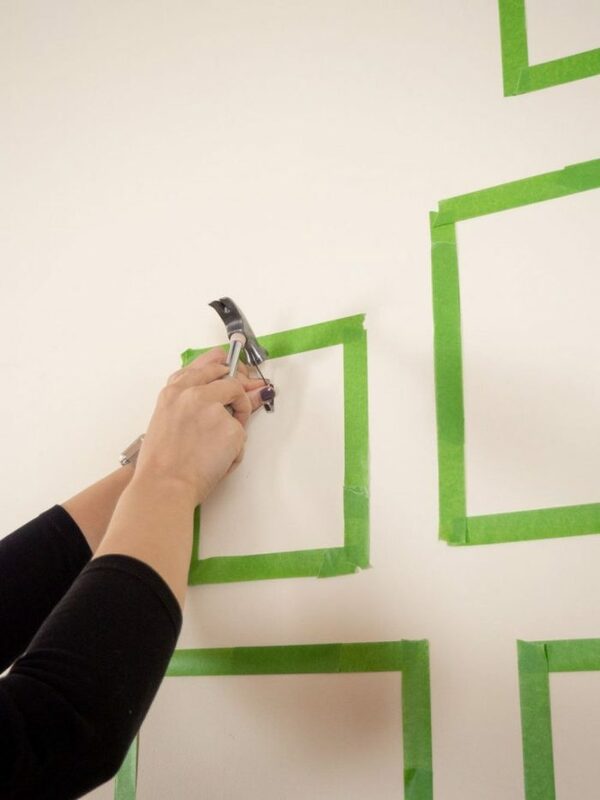 Consider using a low tack brand of painter’s tape to minimize the chance of damage when you remove or rearrange it. Use a ruler and/or a level to help get straight edges. Be as precise as possible, and make sure you measure consistently from the outside edges. Make sure you make note of which spot goes with which size. 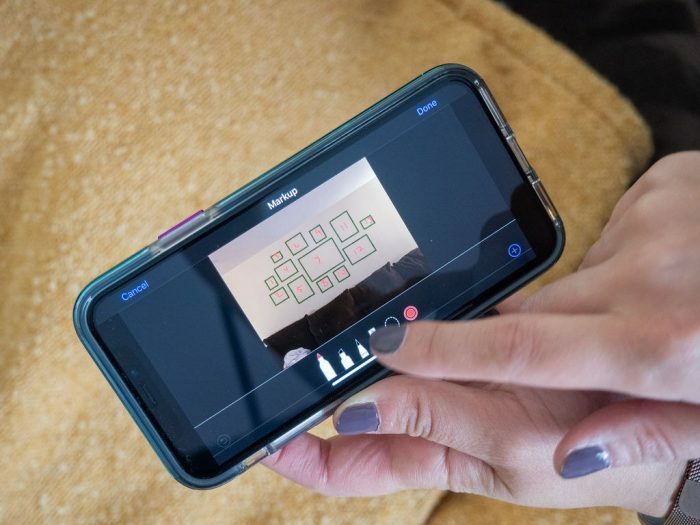 Either use a pencil to write on the painter’s tape for reference or take a quick photo on your phone that you can digitally mark up. Now that you have all the sizes you need, it’s time for the fun part — designing your frames! The nice thing about ordering custom picture frame sizes online is that you can literally match your frames to the exact specifications you blocked in step 2. 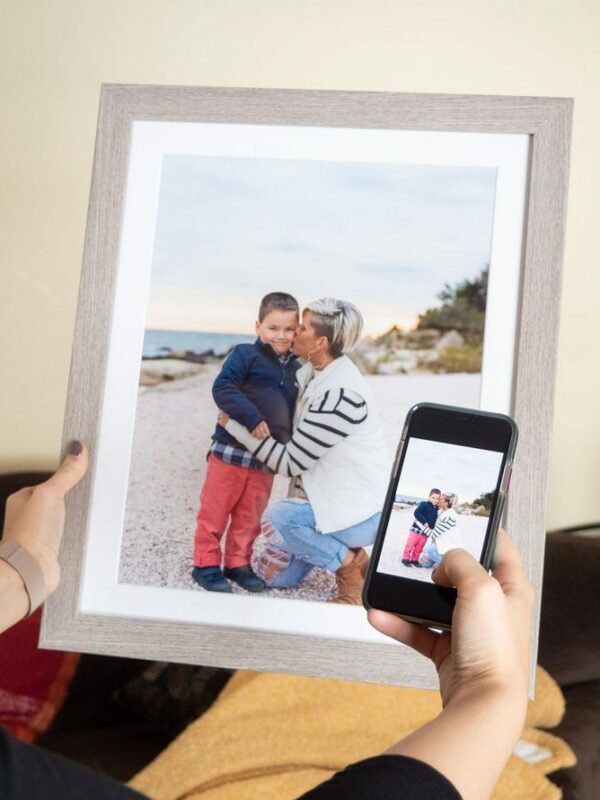 This means your collage will be completely custom to your space, perfectly fitting in size & layout. Once you upload your file and choose your frame style/matting options, you can then click the gray box labeled “Details” at the top. This box is on the right next to “Art Size,” and it will give you your outside frame dimensions. To adjust to the proper outside dimensions you need for each spot in your collage, simply adjust the “Art Size” of your photo. Just remember that changing your frame style, adding matting, or changing your “Art Size” will result in different outside dimensions, so always check the “Details” box before adding to your cart. 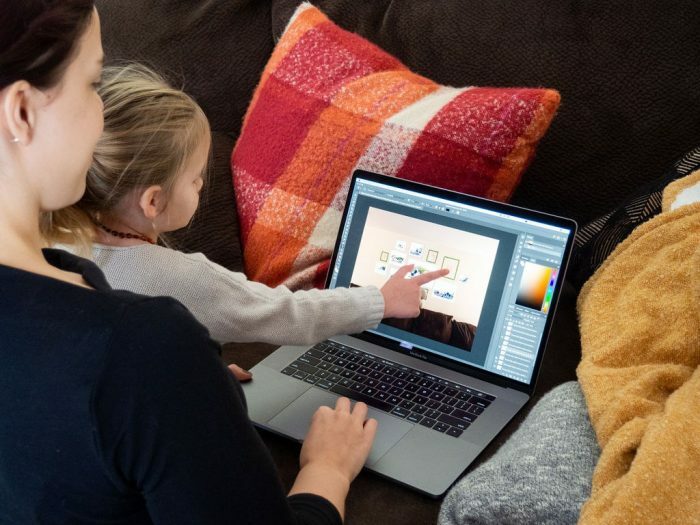 You can also consider using a program like Photoshop to digitally preview your gallery. Take a photo of your blocked gallery, then overlay screenshots of the frames you’re designing to see how it’s all coming together. After you order your frames and they arrive, it’s time to get them up on the wall. To do this you’ll want to measure the distance of the hanging wire (on the back of the frame) from the top of the frame. 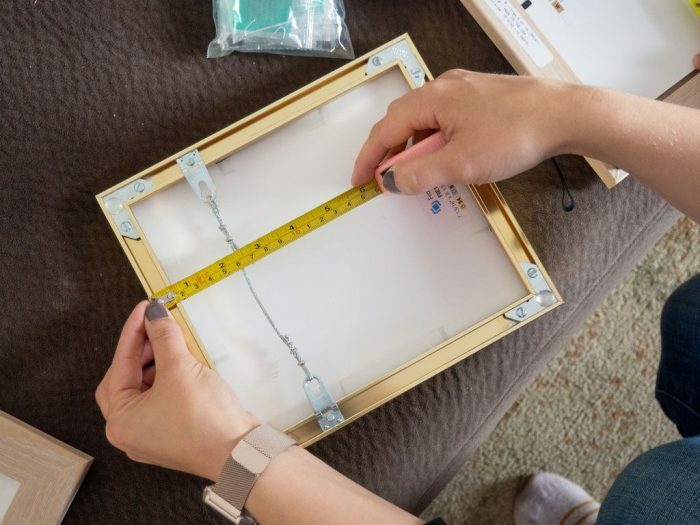 Then you’ll measure this same distance from the top edge of your painter’s tape (with the corresponding location of each frame), make a small pencil mark in the center, and hammer in your nail. Once your nail is in place, remove the painter’s tape. Hang your picture frame on the nail and repeat for all frames until your picture frame collage is complete! Tip: use a microfiber cloth to remove any fingerprints or dust particles to keep your gallery looking crisp & clear! Looking for more inspiration? Sierra from Beautifully Candid shares some great tips for creating a gallery wall, Molly from Almost Makes Perfect will inspire your next frame project with her hallway makeover, and Tina from Eclectic Twist shares a great tip for parents to score some free art to frame. Ready to create your frames? 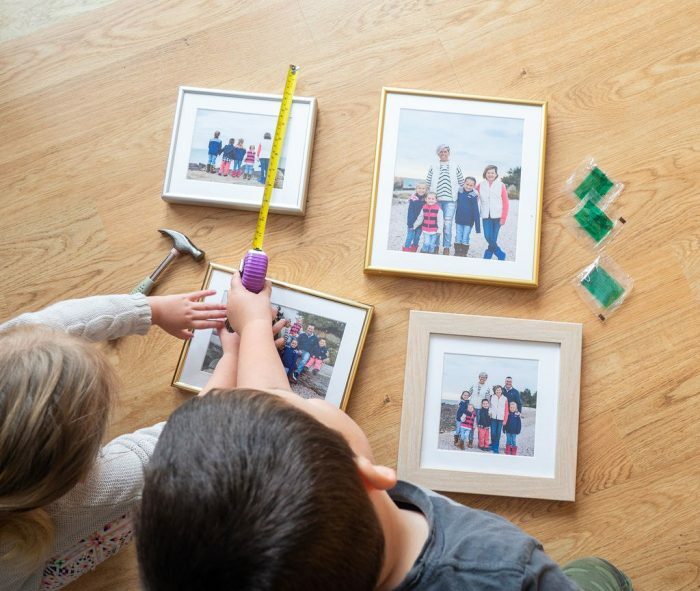 Explore our interactive frame designer and order your custom picture frames easily! and receive a special link for 10% OFF your next order! Wood vs. Metal Picture Frames: Which Should You Choose? How Much Do Custom Picture Frames Online Cost?